There were weak spots in the Piper Cub that were known but really show up when raising the gross weight. The SC is a J3 with a higher gross and a bigger engine. The distance between joints on the longerons behind the cockpit was too long on the J3, so for the SC small tubes were welded in from the top joints to the mid span of the lower longeron. This stopped the longeron from bowing up or down. Then tubes were welded across the bottom from this new joint to the new joint on the other side. Now the longeron can't bow sideways, but it can still bow towards the centre of the fuse. If you hired a structural engineer to design a new fuselage and he brought you these drawings, you would think he was a lunatic. Obviously the Piper engineers were not lunatics, what happened? Two forces govern production airplanes: the certification and the bottom line. It would have been an expensive violation of the type certificate to redesign the structure, cheaper to put "bandaids" on it. We didn't have these restrictions so we added an extra set of diagonals to the fuselage, shortening the spans in a structurally sound way. This also solves the known weak link at the tail spring mount area. Two other weak spots were related to crash protection rather than flight loads. The diagonal in the cockpit ceiling handles extreme loads in tension only. If in compression it can pop violently down and penetrate the pilot's head. Adding a cross brace up there solves this problem. The other area is the side bay of the fuselage immediately aft of the fire wall. A very hard landing can cause the weight of the engine to swing down compressing the bottom longeron, making "s" curves in the floor. In a crash the firewall can be pushed back breaking the pilot's ankles! Again a cross-brace instead of a diagonal makes this less likely. 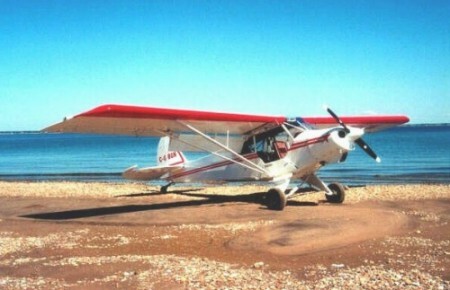 range Lycoming 0320 (150 hp). 52 U.S. gal./44 Imp. gal./197 L.